Home › [Upgraded]Anker Premium Usb-C Hub With Hdmi And Power Delivery 2 Superspeed U..
[Upgraded]Anker Premium Usb-C Hub With Hdmi And Power Delivery 2 Superspeed U.. Fully Compatible with USB-C: Works powered or unpowered and supports USB Power Delivery. Offers full-speed charging through the hub while simultaneously using USB and HDMI devices. Huge Expansion: Transform a single USB-C port into two USB 3.0 ports, an HDMI output and a USB-C input. High Speed & High Definition: Two SuperSpeed USB 3.0 ports transfer data up to 5Gbps, and an HDMI output mirrors your laptop's display (supports 4K) on any HDMI-enabled device. The world&39;s first USB-C hub to use USB Power Delivery. 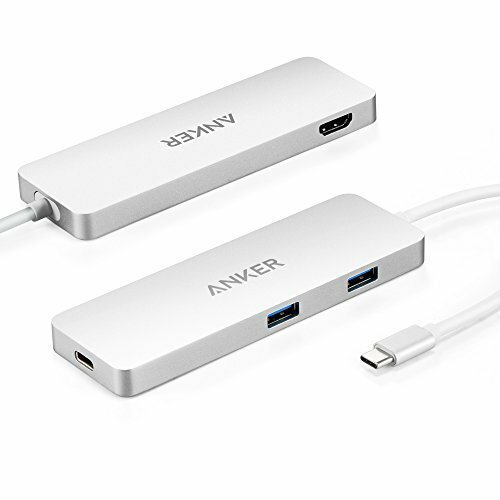 This enables full-speed MacBook (2015) recharging while simultaneously connected to SuperSpeed USB 3.0 and HDMI devices. This hub transfers data over USB at incredible speeds, up to 5Gbps. That&39;s fast enough to transfer a high-definition movie in seconds. We recommend the total current of attached USB devices not exceed 0.9A (or 1.5A if both MacBook and Apple Adapter are connected and total USB output is 7.4W). For best results, use such devices&39; original chargers. With a MacBook and, optionally, an Apple Adapter connected, we recommend using an HDMI cable without a signal booster, as other HDMI cables may not work. Lumia 950/950XL may not supported. 2.4GHz wireless devices (keyboards, mice, etc. ), MIDI devices and some USB 3.0 devices (like certain Western Digital hard drives) may not be supported. Try using the host port or a USB 2.0 connection.